Thus said the Lord GOD, Behold, I will lift up my hand to the Gentiles, and set up my standard to the people: and they shall bring your sons in their arms, and your daughters shall be carried on their shoulders. We see this prophetic verse coming into fulfilment in our days, given to Isaiah 2,700 years ago. The nations are helping with the marvellous return of the Jewish people and the restoration of Zion! God is about to fulfill His promise, and is bringing His scattered people back to their home, in the historic core country of their forefathers. Each month, 2‘500 olim from the four corners of the earth (see Isa 11,12) arrive in Israel, 600-800 from the Ukraine, and same number from Russia. 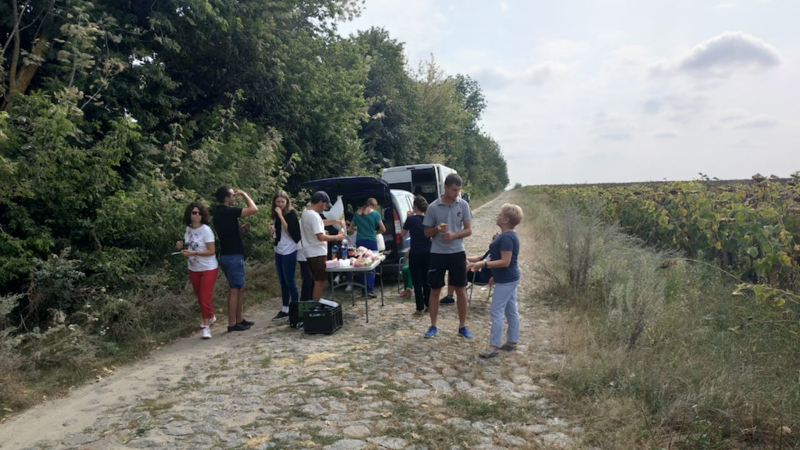 During this year’s Ukraine work trip, our team, representing three different nations (Italy, Germany, and Austria), was able to support the field work headed by Koen Carlier and his team. Along with information and helping in the process of Aliyah, providing transport and accommodation, their work mostly consists of delivering food parcels to the small local Jewish communities in central Ukraine. We started the week by packing a thousand food parcels. A lot of helping hands were there – volunteers, church members, friends, and family of Koen. Each food parcel has a total value of 10 EUR, which might not seem much for Central and Western Europeans, yet represents a significant expense for many Ukrainians. Each parcel was counted and being loaded into buses to deliver to the different Jewish communities across the region. Throughout the week, we get to meet some of the community members at home when bringing them their food parcels. This allowed us more space for personal conversation and relationship building. Oftentimes, (younger) parts of the family have already dared the step of emigration. This means that it is mostly the elder generations that stay behind in the Ukraine; many of whom do not want to permanently leave their homeland due to their advanced age – although you can clearly feel the longing for Jerusalem expressed through their stories. It especially impressed me how hospitable people were; their joy, hope, and openheartedness in spite of adverse circumstances, strokes of fate, difficult living conditions in the Ukraine, not being 100% healthy. A particularly vivid memory is the one of Bronia Feldman, whose overflowing joy and joie de vivre is contagious. Together, with linked arms, we walked to the oldest clay synagogue in Ukraine, in Bershad. We met more of the Jewish community there, unloading food parcels, and wished them a happy and sweet new year during the upcoming holidays. Fima, responsible for the local Jewish community, guided us through the former Stetl and impressed us with his vibrant and historically accurate depictions of the history of the Shoah and regional anti-Semitism. In addition to practical activities, our team learned more about the Shoah in Ukraine, visited museums, monuments, and mass graves, and most importantly, listened to Holocaust survivors telling their stories. We had the honor of meeting Rita Schweibes, listening to her story while standing at the gates of the former Pechora death camp, which today houses a rehabilitation center. She described how she survived as a 5-year-old orphan in inhumane conditions, cold, hunger and illness. We silently traveled the “road of death” by bus, the 20km route from the city that Rita was forced to walk to the death camp. Even by car, it seems to take a very long way. A little farther in the woods, she showed us the pit that was dug for her and her sister, plus the other survivors at the time – however the Red Army freed Transnistria in the spring of 1944, before the grave ever became her final resting place. Rita prayed in Yiddish at the grave of her mother; a particularly moving prayer for anyone who understands German. One can feel that Rita has forgiven wholeheartedly. The rest of her life she spent as a midwife, bringing life into the world after all the death she has faced. With linked arms I walked with Raya, another survivor of Pechora, along the overgrown graves, and wondered who will maintain them if Rita ever leaves us? Finally, she blessed us and wished us and our families happiness, health, and peace so that our children’s children shall never endure such suffering. Till this day, she stays faithful to her promise to God that if she survived the death camps, she would tell everyone about the horrors of the Shoah. We were just three twenty-somethings listening to her on this day. I wish more young people from Europe would develop a sensitivity to our history – to learn, to understand correlations, dynamics, and not least spiritual principles. More than a thousand Holocaust survivors pass away every month who can still tell us their stories first hand. Of course, Holocaust research and contemporary history is well advanced by now. More and more stories of survival and escape are being documented – in Yad Vashem you can learn in all details about the Holocaust. And yet, reading a book or visiting a museum fails to compare to actually facing that person when she or he is sharing their story. Even political events did not leave us unaffected. We visited the Donetsk Jewish community headed by Rabbi Vishedsky, who had to flee from the conflict with Russia and has now organized a modern prayer and teaching centre for his community members in the centre of Kiev. We heard about the flourishing Jewish life there, the new ravages of a war that nobody wanted, and the repeated escapes. Nearby in Bila Tserkva, located in Kiev Oblast, the municipal policy makes you think. For the first time in the turmoil of the war (World War II), 90 Jewish children were murdered by explicit order. Natalia Rudianskaya, secretary of the local Jewish community, and Marina Serbin, director of the Jewish orphanage, accompanied us. Even today they cannot lead us to the real site in the forest, as money is lacking to find out, through complicated research, where exactly the executions took place. The city administration is not interested in the construction of a memorial. And this in a city where nearly the entire Jewish population which still lived there in 1941 (15,000 to 20,000 people), were killed. Natalia and Marina lead us through the Jewish school, which their children attend. In every room you can feel the diligence and love that was put in there. Christians for Israel Ukraine supports the school and kindergarten with the procurement of the kosher kitchen. Some children are cases for the social welfare, so Marina decided to establish a “place of refuge” where children can live safely until their parents are back on their feet. The two ladies show us a documentary about the children’s massacre in Bila Tserkva, a film into which they put a lot of time and effort. After all – it’s about their families. We cried together and shared their pain in this place, where today again Jewish children are entitled to their lives. We also laughed together though, over dinner, gefilte fish, and over the greeting video, which we sent to the director, who is currently participating in the 120th anniversary of the Brodsky Synagogue in Kiev. Finally, hugs and kisses are exchanged, with the promise to visit the new memorial upon our return. For our last night, we returned to the “Shelter” near Kiev, where we arrived a week ago. The place lives up to its name: Ukrainian Natalia has comfortably furnished the spacious house and garden, so that Jews would feel at home. Megilla at the door entrance, many Hebrew lettering decorate the walls, a Natla is provided in the bathroom for the ritual washing of the hands – hundreds of Jewish families have stayed here in the past years. Some stayed one night, some a week, some more. All were refugees from the war region in eastern Ukraine, Olim on their way to Israel, seekers of refuge and peace. The whole trip was a week of encounters, of learning, of helping each other. The bewilderment and horrors of the history of the Shoah faces the hope and joy that Jews bring with them when they return home according to God’s promise. In this sense: Shana tova u-metuka, may the new year bring you a lot of good and sweet!